Peter Bergen is CNN’s national security analyst, a vice president at New America and a professor of practice at Arizona State University. 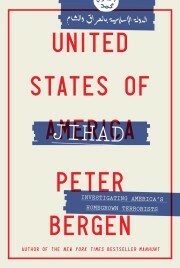 He is the author of “United States of Jihad: Investigating America’s Homegrown Terrorists.” This is an updated version of a story that was published in October, 2017. (CNN)Americans often think of themselves as belonging to an exceptional nation, and in many ways they do. They belong to a tolerant, multicultural society that has led the world toward a more innovative and more inclusive future through new technologies and a unique embrace of diverse cultures. But the United States also leads the world in other ways that don’t match the often complacent self-conception that many Americans have of their own country. The United States locks up more of its population proportionally than any other country in the world, including authoritarian regimes such as Russia and China, according to the International Centre for Prison Studies. It also leads in another dubious statistic: More Americans are killed by fellow citizens armed with guns than in any other advanced country, according to the Small Arms Survey. In 2011 alone, according to FBI statistics, more than 11,000 Americans were killed by firearms in the United States (a figure that excludes suicides). Despite all the reasonable concerns in the United States about jihadist terrorism, in any given year Americans are almost 2,000 times more likely to be killed by a fellow American armed with a gun than by a jihadist terrorist. Since the 9/11 attacks, 103 people have been killed on US soil by jihadist terrorists, according to data collected by New America. In October, in fact, eight people were killed in a terrorist attack in lower Manhattan. By contrast, in the United Kingdom, a country which is similar to the United States in terms of its laws and culture, Britain suffers around 50 to 60 gun deaths a year in a country where the population is around a fifth the size of the United States. In other words, you are about 40 times more likely to be killed by an assailant with a gun in the United States than you are in the United Kingdom. To be sure there are occasional mass-casualty attacks in Europe by murderers armed with guns, such as the assaults by the neo-Nazi Anders Breivik, who killed 77 in Norway in 2011, and the attack in Dunblane, Scotland, at a school where 16 children were killed in 1996, but these are exceptions to the rule. We still don’t know the motivations of Stephen Paddock, who lin October 2017 carried out the worst mass shooting in modern American history, killing at least 59 and injuring more than 500 in Las Vegas, but what we do know, so far, is that he had 23 rifles in the room from which he launched his rampage. Paddock also hailed from Nevada, a state that allows “open carry,” which enables its residents to openly display weapons in public. Which other civilized country allows its citizens to show up, say, at a Starbucks carrying semi-automatic guns? Texas is another open carry state whose citizens can carry rifles and handguns openly. Twenty five people and an unborn child were killed when a shooter opened fire at a church in Sutherland Springs, Texas, in November. A man who lives near the church used his own rifle and shot at the gunman, said Freeman Martin, a Texas public safety official. “The suspect dropped his rifle, which was a Ruger AR assault-type rifle and fled from the church,” according to Martin. The Second Amendment, of course, is the Second Amendment, so certainly American laws allow the possession of weapons by its citizens. But it’s unlikely that the Founders’ intention was to let troubled American citizens acquire arsenals to kill as many as their fellow citizens as possible. With each new outrage — from the Sandy Hook massacre to the attack on the gay nightclub in Orlando to the Florida high school shooting — there follows a certain amount of soul-searching by the American public and policy makers about the distinctive American gun culture that has developed in recent years, where pretty much anyone can acquire an arsenal of weapons. But each time the moment of self-reflection seems to pass. This is a tribute to the political muscle of the National Rifle Association which embraces a Second Amendment absolutism that allows even the dangerous number of less than 1,000 Americans who are on the “no fly” list to legally purchase semi-automatic weapons. One can only hope that the tragic events in Las Vegas and Texas and Florida may change this. However, given that previous tragedies have not changed this deadly equation, there is really little reason for hope. That resigns us to a dystopian future where Americans attending something as innocuous as an office holiday party in San Bernardino in 2015, or partying at a nightclub in Orlando the following year, or attending a country music concert in Las Vegas or church in Texas have to live with the lethal reality that they may become the innocent targets of their well-armed fellow citizens. Correction: An earlier version of this article misstated the name of the shooter in Norway as Andres Breivik.